Summary: Yaks yak, dogs dog dogs, crows crow. Each two-page spread has an animal whose name is also a verb; the illustration depicts the animal demonstrating the action and includes a definition of the verb. The final two pages list all the words, with a history of both the animal name and the action word; at the top of the list is a definition of homographs, words that are spelled and pronounced the same but have different meanings. 40 pages; ages 4-8. 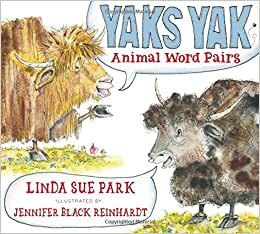 Pros: Word lovers will have lots of fun with this book and will enjoy thinking of more homographs when they’re finished. The illustrations are adorable with plenty of humor. Cons: I struggled to think of even one other animal homograph…bears bear bears? Just read this yesterday–it’s brilliant. Such wonderful & funny illustrations!